Manav Garima Scheme Gujarat: The Government of Gujarat, known for their advantageous schemes for the people of the state is very concerned about every single individual. With the help of The Ministry of Tribal Affairs, the state government has launched to encourage the entrepreneurship in scheduled cast individuals and thus, improving employment. People from the SC communities can start their own business and run it successfully by applying into this scheme. The government will help these applicants financially. They can uplift their life and their families’ future by working for their own in whatever the location they want to work in. Financial assistance for the scheduled caste persons desirous to start their own enterprises in cottage industries without obtaining bank loans and for self-employing. On income limit of 47,000/- in rural areas and 60,000/- in urban areas. The government will approve financial assistance of 4,000/- rupees to the one for equipment. Implemented through Gujarat Scheduled Caste Development Corporation, Gandhinagar. 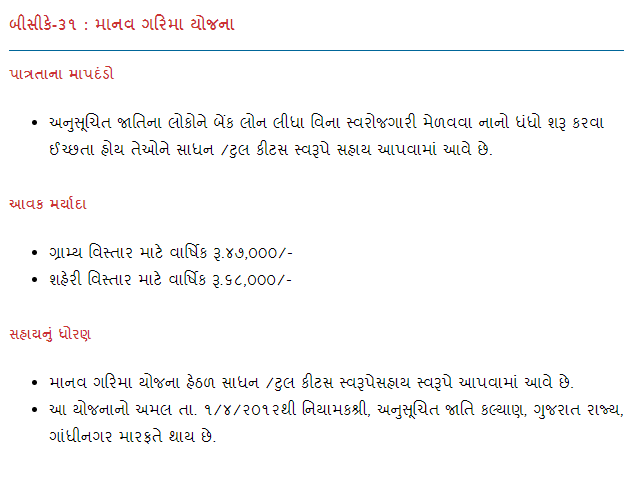 The applicant must be the resident of Gujarat. The applicant must be from the Scheduled Caste. The annual income of the applicant must be as per norms. Rural income limit is set to 47,000 and urban Income limit is set to 60,000. Aadhar card, Voting ID card, College ID etc. From the official website of Ministry of Tribal affairs, anyone can download the application form and then apply for the same with above mentioned documents. Applicants can contact Social Justice and Rights office for further information. Or they can even contact to Gujarat Scheduled Cast Development Corporation, Gandhinagar. Likewise, so many schemes being launched or had launched previously by the Government of India, and State Governments; it is very helpful for the minority communities to grow in their particular way. Some, criticize the government but the ones who knows how to take advantages of every governmental scheme for such low income caste and religion will definitely be the beneficiary of the scheme and will take benefits from the government. Apart from Manav Garima Yojana, Government of India has also launched MUDRA YOJANA, in which enthusiastic entrepreneurs can take loans from the government up to 8,00,000/- rupees or even more. This type if schemes have always helped people starting their own work and become successful. Especially in India where caste discrimination still exists and a lot of people suffer from it physically, mentally and socially. These type of schemes will make them independent. They can start working from home, they can keep their tribes alive by a lot of ways if they really want to. Scheduled Caste students or youngsters, or even ladies, housewives can also apply for Manav Garima Yojana and earn as much as they want gradually. This very scheme has helped a lot of females or purchasing sewing machines and work from home. They have eventually uplifted their family income & family lifestyle by earning by their selves. What is a Cancelled Cheque?? How to Create Cancel Check?